Although currently based in Massachusetts, where she's studying for her M.F.A. in Dramaturgy at Harvard's American Repertory Theater, Julia's a Jersey girl born and bred. She fell in love with Princeton while studying at Princeton University, and returns often. She has published in The Yale Historical Review and HowlRound: Journal of the Theater Commons, among others, and serves as a contributing writer for the A.R.T. 's biannual magazine. You can keep up with her at jbumketheater.wordpress.com. 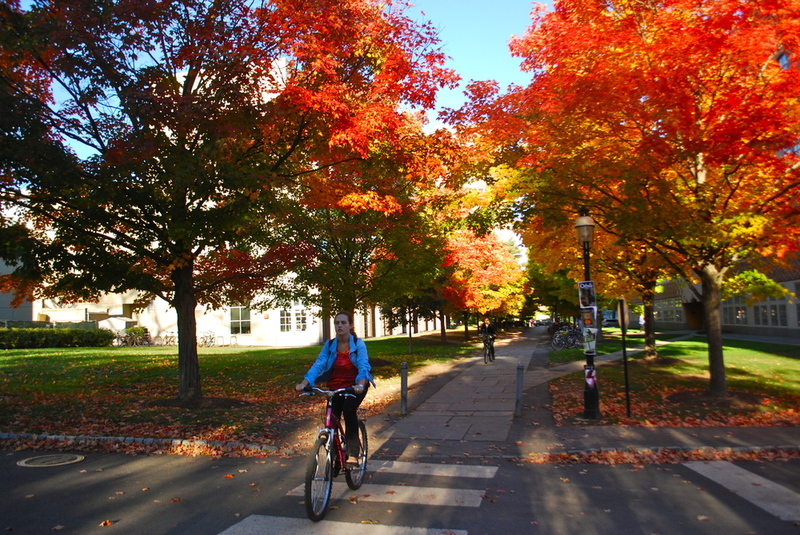 Relationship to Princeton: I'm from New Jersey originally, and lived in Princeton for four years of college--and my boyfriend's parents live in the area, which offers an ideal excuse to keep coming back. Writer you'd like to invite to dinner: I'd say F. Scott Fitzgerald, but that's cliché around these parts; I'll go with Christopher Durang, whose plays Miss Witherspoon and Vanya and Sonia and Masha and Spike both had their world premieres here in Princeton at McCarter Theater. Chef you'd like to prepare the meal: Teresa Azaria Momo, the namesake of Princeton's Teresa Caffé. Writing soundtrack: Something folky but with a percussive rhythm, like Punch Brothers or Nickel Creek. Coffee or Tea: Tea, but coffee if it's at Small World (more on that later). Paperback or Hardback: Hardback, every time. Labyrinth Books. This bright and airy indie bookstore has everything from architecture coffee books to 19th-century Russian novels, along with greeting cards, notebooks, puzzles, and more. Don't miss the basement's used book section, which hides some real gems. Members get discounts, free shipping, and extra perks. Friends of the Princeton Public Library Book Sale: Tucked between the Library's café and its checkout counter, this cash-only bookstore is ideal for snagging cheap hardcovers and back-issue literary magazines. All proceeds go to the Friends of the Princeton Public Library, which also hosts a massive annual three-day book sale in the library's multipurpose room. Cloak and Dagger. This out-of-the-way find, roughly 20 minutes from the center of town, is dedicated entirely to mysteries. Be warned: hours may pass before you know it. Jazams. If you're looking for a beautiful children's or Y.A. book, head straight to this toy shop's expansive literary section in the front of the store. They also host free outdoor kid's movies in Palmer Square in the summertime. Bryn Mawr-Wellesley Used Book Sale. Every year in mid-March, Princeton Day School hosts a weekend-long event where 85,000 books of all kinds are sold at bargain prices (usually $1-5). People flock from all over the Northeast for the Sale, and all proceeds go towards academic scholarships at Bryn Mawr and Wellesley Colleges. Princeton Public Library: The best place around for getting uninterrupted work done, with free WiFi, a big collection of magazines and newspapers to browse, and beautiful study carrels with views of the town. In summer months, the library's front courtyard becomes a popular hangout, with tables and a great weekly farmer's market. Chancellor Green Library is one of the most quintessentially Ivy League libraries on campus, with a stained-glass octagonal ceiling and dark woodwork. It doesn't require a University ID to get in, but the upstairs carrels and plush leather chairs get claimed fast. Regardless, it's a beautiful space to explore, and there's a café downstairs that brews Small World coffee. Lewis Library: This Frank Gehry-designed structure is another spot that's open to the public during regular business hours; its "tree house" reading room, with soaring modernist ceilings and countless hanging lights, is stunning at night. Althea Ward Clark Reading Series, Lewis Center for the Arts. Princeton's creative writing program, which houses literary greats like Joyce Carol Oates, Jeffrey Eugenides, Chang Rae Lee, Paul Muldoon, and Tracy K. Smith, hosts a reading series that includes new works from the likes of Jhumpa Lahiri and Jamaica Kincaid, along with faculty and students. The Lewis Center also hosts talks by playwrights, screenwriters, theatrical directors, and more through its Program in Theater. Princeton Public Library. This library hosts a Writers Room, along with a number of writing groups and book clubs. It also has readings from fiction and non-fiction writers alike; in past years, Nicole Krauss and Gail Collins both read to full houses. Labyrinth Books. Labryrinth hosts a full season of readings in its Nassau Street shop. McCarter Theater Center. McCarter has a storied literary history: it's where playwrights like Thornton Wilder premiered their work; where F. Scott Fitzgerald wrote comedy as an undergraduate; and where modern playwrights like Christopher Durang and Nilo Cruz have premiered their plays. It also hosts free readings and workshops for works-in-progress in its Berlind Rehearsal Space. 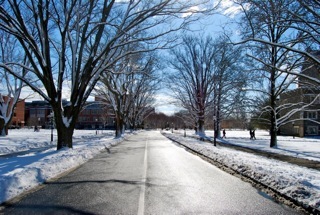 The Arts Council of Princeton. Home of art shows, concerts from local groups, poetry readings, and more; its extensive events list is a boon when planning a visit. Yankee Doodle Tap Room. For a taste of the old-school, clubby Princeton of F. Scott Fitzgerald's time, don't miss the Yankee Doodle Tap Room in Palmer Square, with its dark wood bar and huge Norman Rockwell mural on the wall. Small World Coffee. Both locations of Small World Coffee win the prize for my favorite spot in town. You can't go wrong with either location, but Witherspoon is best for settling in for a long morning with a delicious brew, and it also has a larger pastry selection, with mouthwatering pumpkin muffins and blueberry-lemon scones. Infini-T Café and Spice Souk: This comfy basement spot across from the Public Library has the best tea and chais in town, and its extensive café menu makes it a great brunch spot. It also hosts nighttime concerts, Aryuvedic cooking classes, and more. It's worth following them on Facebook, where they list amazing deals (like coveted free pancake days on weekday mornings). Rojo's Roastery: Although my loyalty is to Small World, this newest addition to Palmer Square is definitely worth a stop. The company runs a small-batch, artisanal roastery out of nearby Lambertville, NJ, and their Princeton café is quickly gaining a local following. Olives. This family-owned food market and catering company offers everything from cheap breakfast sandwiches and pasta salads to Valentine's Day-worthy dinner takeout. Teresa Caffé. The Momo brothers run some of the top restaurants (Mediterra, Eno Terra, and Teresa Caffé) and sandwich shops (Terra Momo Bread Company, Terra Libri, and Terra Teatro) in the greater Princeton area. My favorites are Terra Momo Bread Company, which makes a killer ham and brie baguette, and Teresa Caffé, which specializes in inventive pastas and wood-fired pizzas. Teresa's pizza e vino prix fixe menu on Monday nights is to die for. One 53. Located in nearby Rocky Hill, this restaurant focuses on seasonal reimaginings of American staples: think duck grilled cheese sandwiches, lobster pot pie, and dessert floats made with local stout instead of root beer. It's worth stopping by for their rotating craft cocktail menu alone. Blue Point Grill. At Blue Point Grill, you'll find offerings fresh, local seafood, beautifully prepared. Its owners also run Nassau Street Seafood and Produce, an extensive fish market, which is located next door. The Bent Spoon. Adventurous options abound at this cult favorite gelato and sorbet shop, with flavors like lavender earl grey, basil, and Meyer lemon mascarpone. Their cupcakes, cookies, and habanero hot chocolate are also delicious. Halo Pub. This is the small-town ice cream joint you wish you'd grown up with, with rock-bottom prices for ice cream made with ingredients from local Halo Farm. My favorites are their strawberry chocolate chunk and the mint Oreo, but it's hard to choose. They also host live bands on Saturday nights in warmer months. Chez Alice. Although the towering wedding cakes in the window showcase Chez Alice's culinary street cred, the vibe of this bakery/café is pleasantly low-key. Their miniature cakes are perfect to share with a friend. 1. Favorite view: Palmer Square at Christmastime. The square has a 65-foot live Norwegian spruce that gets decorated with over 30,000 lights every year, where the town hosts caroling concerts throughout December. The scene unleashes everyone's inner five-year-old. 2. Favorite place to write: I like to vary where I work, so my ideal writing day starts early at Small World Coffee, and then moves to the Public Library down the street. There are carrels upstairs that catch the morning light, and it's the perfect place to focus. I go downstairs and refuel at Terra Libri, the library's in-house café, whenever writer's block hits. 3. Favorite museum: The Princeton University Art Museum is great, but my favorite local art spot is the Lewis Center for the Arts. It houses gallery exhibits from up-and-coming artists, as well as shows by undergraduates as part of their senior theses. 4. Favorite coffee shop: Small World Coffee, hands down. It's the place I miss most about being a Princetonian--a relaxed literary vibe, poetry readings and concerts at night, and delicious brews--and it's the first place I visit every time I come back. 5. Favorite thing about Princeton: the friendly locals, and all of their dogs! It's a beautiful area, and the town comes alive on weekends in the spring, when everyone takes advantage of the beautiful magnolias. Every April, the Arts Council of Princeton co-hosts Communiversity, a town-gown street fair with live music, dance, crafts vendors, and more, and the whole town comes out to celebrate; it's incredible.